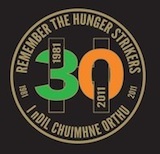 An account by the Bobby Sands Trust of how the famous 1981 hunger strike, 30 years ago this year, came into being. In May 1972, a hunger strike commenced in Belfast Prison, which IRA prisoners ended 35 days later when British Direct-Ruler William Whitelaw gave in and granted ‘special category status’, that is political status to political prisoners. From then, until 1976, many thousands of Irish men and women served their prison sentences under this special category regime in the cages of Long Kesh, and in A-Wing of Armagh women’s prison.. Between the years 1971 and 1975 thousands of additional prisoners, interned without trial, had a similar status in Armagh, Magilligan, Belfast Prison, the prison-ship Maidstone, and Long Kesh. The majority of protesting prisoners, both men and women, were in their late teens or 20s and over 80% were imprisoned solely on the strength of forced confessions. They were refused from the beginning of their sentences all exercise facilities, reading or writing material, and access to radio or newspapers. Kept in cells on a punishment diet, with loss of all remission and without furniture, they were constantly beaten and harassed. Sinn Fein and Relatives’ Action Groups began a protest campaign, mostly confined to the Six-Counties, on the prisoner’s behalf. Public interest had alsthe Six Countieso been aroused by the Amnesty International report of June 1978, which stated categorically that: “Maltreatment of suspected terrorists by the RUC, has taken place with sufficient frequency to warrant establishment of a public inquiry to investigate it”.